As much as we enjoyed every minute of our time watching polar bears on Natural Habitat’s Tundra Lodge, it was a refreshing change of pace each day when we got a chance to head out on the ubiquitous Polar Rovers to explore the tundra. 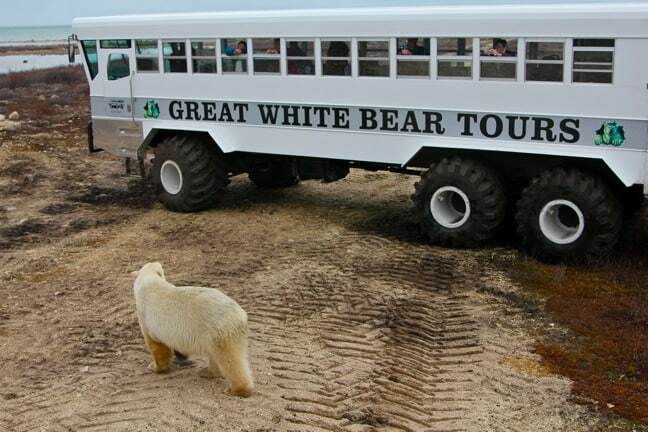 Owned and operated by NatHab’s partner, Great White Bear Tours, these massive ATVs became our second home away from home, and we’d spend about half of each day roving the area in search of wildlife. And while animals in Africa may be ambivalent about safari vehicles, the polar bears proved endlessly curious and often walked right over to them. 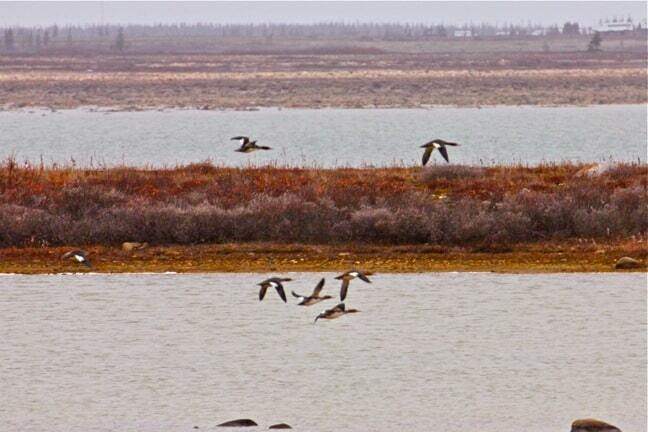 Less than 20 vehicles are permitted into Churchill‘s Wildlife Management Area, and usually we’d see less than 10 per day. All of them are required to drive along roads originally built by the military when they tested rockets in the area decades ago. But until winter weather turns water to ice, you have to ford myriad fresh water lakes to get from one stretch of road to the other. The downside is that we typically crawled along the rocky, crater-filled terrain at a snail’s pace. The upside was incredible scenic vistas like this one, radiant with the vibrant colors of autumn. The landscape was largely barren (the tundra is essentially a cold desert), with the exception of this old observation tower. 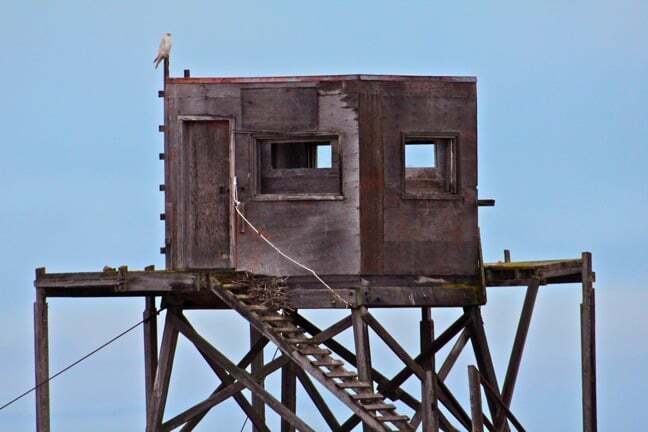 Scientists once used the tower as a blind from which to observe the impact of Churchill’s ecotourism initiatives on the polar bears, ultimately concluding that their behavior was basically the same whether Polar Rovers dotted the landscape or not. Now, it serves as a nesting spot for this Gyrfalcon– the largest falcon species, a hunting bird prized by the Vikings, and the national symbol of Iceland. Natural Habitat divides guests into two groups, with one going out in the morning and the other going out after lunch. Though the other group mentioned they hadn’t spotted much wildlife on one of their excursions, we had extremely good luck on all of ours. Here, we see a small flock of Red-Breasted Mergansers in flight above one of the lakes, with the colorful tundra running right down the middle. This diving duck species is among the fastest birds in level flight, reaching speeds of 100 mph. 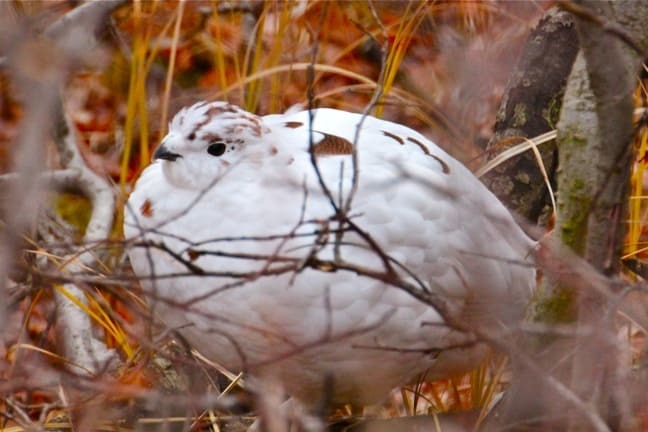 The Ptarmigan, the official bird of Canada’s Nunavut territory, is often referred to as the “snow chicken” or “tundra turkey.” A member of the grouse family, its feathers turn from brown to spring and summer to white in autumn and winter, providing great camouflage in snow but making it stand out like a sore thumb against this colorful backdrop. Mary has a thing for owls due to the fact that they were her college sorority mascot (shout out to the Kappa Kappa Gammas!). Last year, for Christmas, I did a symbolic adoption of a Snowy Owl for her via our friends at World Wildlife Fund, and the stuffed animal that came with it now sits by our bed. It was pretty amazing to get a chance to see these magnificent birds in the wild: They were often very close to the road, and we’d usually observe them for more than half an hour. With this one, we started nearly 100 yards back, then gradually inched closer and closer until we were about 20 yards away. The shots we were able to get were an excellent reward for our patience. The Caribou herds of Canada’s northern territories (particularly Nunavut and Manitoba) are legendary, with the Qamanirjuaq (ka-min-YOO-ree-ak) herd estimated to be between 300,000 to 400,000 strong. 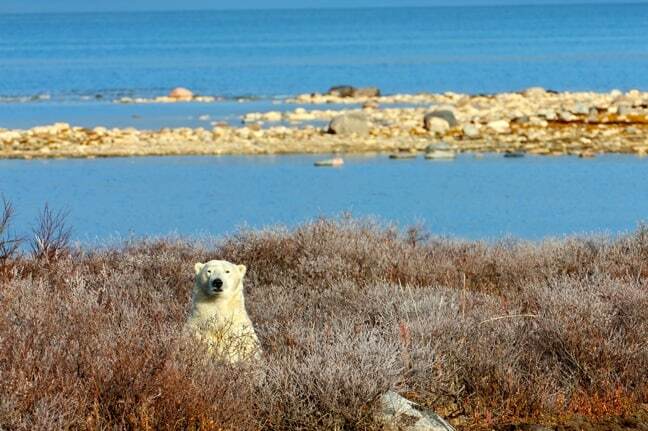 But our NatHab guides, Annie and Bonnie, explained that they rarely ventured into the areas we were exploring around the Hudson Bay, where hundreds of polar bears congregate every year to wait for the sea ice to form so they can head out on the hunt for ringed seals. 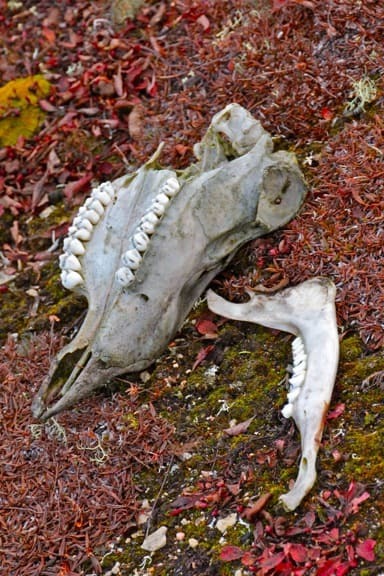 This caribou skull was a solemn reminder that these bears were hungry, and will eat whatever they can catch. Eventually we reached the farthest point in our journey– the lodge of NatHab’s rival, Tundra Buggy Adventure. We were shocked to see several employees walking on the ground around the lodge, which we were told is a serious no-no. We understood why it was a no-no all too clearly when we saw this bear sleeping hidden in the underbrush less than 75 yards from where the men were standing. Did I mention that polar bears have been clocked at speeds up to 35 mph? And though they look massive when standing, when prone they can easily hide in 2-foot tall grasses. 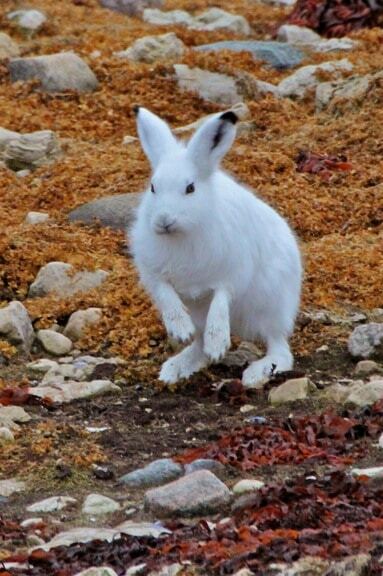 One of my favorite wildlife sightings was the Arctic Hare, a large polar rabbit that can range up to 15 pounds in size. 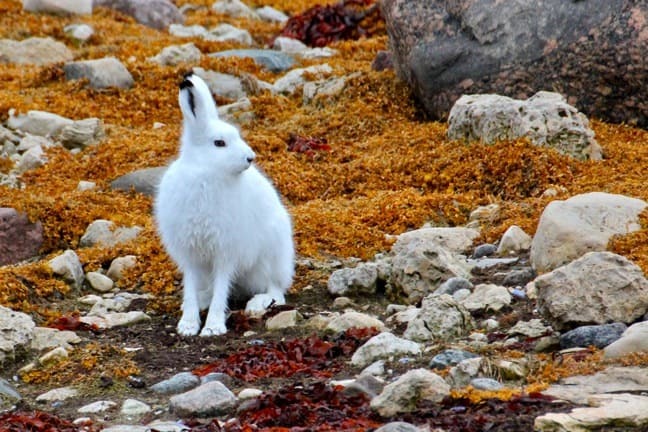 Like the ptarmigan, these beautiful bunnies change the color of their coats to camouflage themselves as seasons change. But our driver, Jason, was able to spot this one from over a hundred yards away, as his brilliant white fur stood out against the tundra. A fairly rare sighting to begin with, our Arctic Hare encounter was made even more special by the circumstances in which we spotted him. 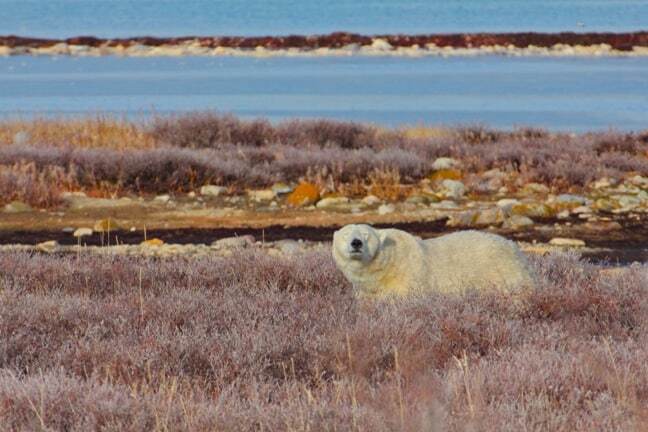 We turned a corner to find him sitting on a peninsula by the Hudson Bay and, like most rabbits, he froze when he saw us. That allowed Jason to slowly creep in closer, and gave the photographers on board plenty of time to snap off dozens of shots at our leisure. There was no underbrush nearby for him to hide in, so he actually had to run towards our Polar Rover in order to get away. For a wildlife photographer, opportunities like this are a rare gift! If there’s any downside to visiting Churchill in mid-October, it’s that the animals all seemed to be in the sort of “walking hibernation” mode we discussed in our previous post. In short, there wasn’t a whole lot of action going on. 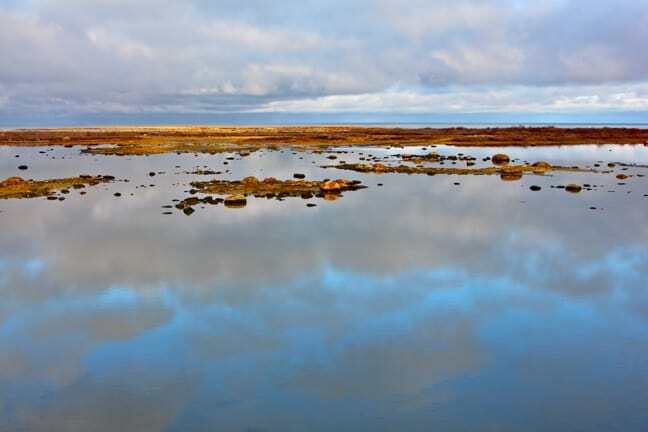 But, for those who get a rush of adrenaline just from watching wildlife in its native habitat, the trip was an Arctic dream come true. We must have sat watching this snowy owl for nearly an hour as he preened, posed and watched us watching him. 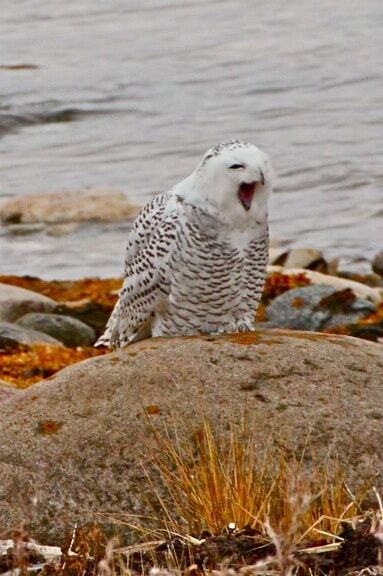 Our patience was ultimately rewarded with this incredible shot when he yawned. 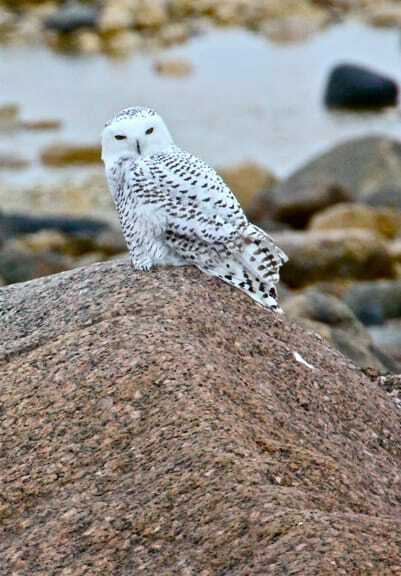 If Churchill has a “Big 5” for wildlife lovers, it’s the Polar Bear, Arctic Hare, Snowy Owl, Ptarmigan and Arctic Fox. The last one proved the most elusive, and spotting it became our primary mission on our last Polar Rover expedition. Like other Churchill wildlife, the fox’s coat changes color with the seasons, and their numbers have suffered over the years due to trapping (their pelts are highly coveted) and a fluctuation in the population of their prey (primarily lemmings and voles). But the biggest problem facing Arctic Foxes is this guy, the Red Fox. 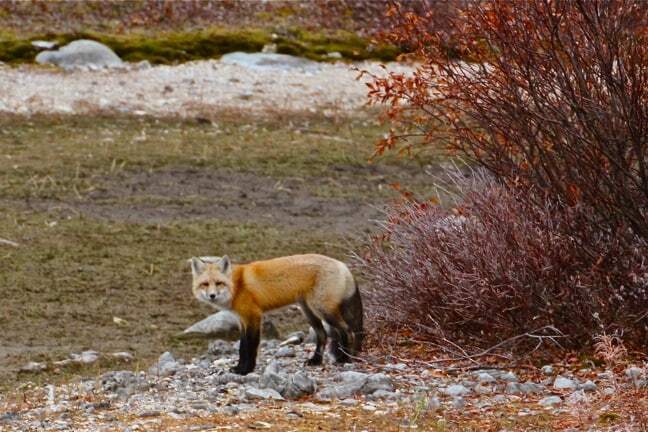 As climate change continues to have an increasing impact on the region, the larger Red Foxes are moving further north and beginning to dominate the Churchill area by killing Arctic Foxes and their kits. 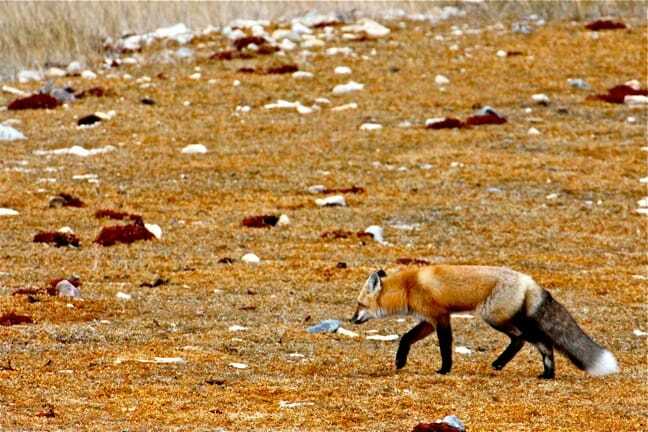 In northern Europe, some countries allow Red Foxes to be hunted where they’re encroaching on Arctic Fox territory. But, while we never got to see its Arctic cousin, everyone oohed and aahed as we watched this bushy-tailed beauty hunting for voles on the open tundra.